I have completed the second image in my "Botanical Blends" project and thus have accomplished half of my goal for the month. Of course, the goal does not merely reflect the number of images completed, as the images need to be of the appropriate quality as well. Artistic quality, however, is for the viewer to decide. 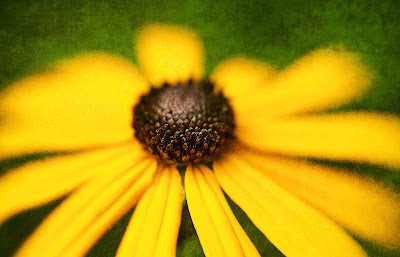 This particular image was made with a LensBaby. Unfortunately, the small image size that Blogger displays makes it difficult to see the underlying blended texture in photographs where the texture is subtle. However, there is not much that I can do about that! In my last post, I mentioned that I was going to specifically answer the questions I thought were important to consider when planning a photography project as they relate to my recently initiated "Botanical Blends" series. However, before I do so I would like to add one more important concept to the planning stage of my project. This is likely important for anyone planning a project, but is particularly apropo for me, as I tend to spend too much time on any one image, making changes that I am sure no viewer will likely notice. This concept has to do with deadlines. I believe it is important to set a reasonable and achievable schedule for producing the project. This schedule will be different for everyone depending on their 'life circumstances' and available time to devote to the project. However, it does need to be achievable while allowing for completion of the project within a reasonable time period. For this project, given the subject matter, I define my audience widely. I believe it would include anyone with an interest in flowers and horticulture as well as nature. In addition, as a secondary audience I would include people that I work with and/or my patients, as I will likely have an opportunity to display prints at work and in my office. How do I primarily intend to reach that audience? The primary goal I hope to achieve is to have a display at a local botanical conservatory. Obviously, I can not be sure that the goal will be achieved as the decision to hang prints there is not one that I make. Thus, I need additional viable methods for getting the work seen. For this project, that would include hanging prints at work/office. In terms of other distribution methods for the project, I am considering a pdf publication (though I have not used InDesign or Acrobat before and thus this will have a fairly steep learning curve and will probably not be coincident in time with other distribution methods), as well as possibly making some 'give away' promotional type prints. Are prints needed? How many? What size? Since my primary, and at least one of my secondary methods of distributing the work is via display, prints will clearly be needed in larger sizes. My plan is to have prints matted and framed to 20x26 inches. Why that size? As I have made some flower images in the past, this size just looks right for display to me and I already have some frames in this size as well. It is also an efficient size, as it allows me to obtain two mats and backing boards from standard sized 32x40 matboard and foamboard. Given that I hope for a formal display in a conservatory, standard white matting might be best, but I still have not ruled out the possibility of black matting. The frames will be simple and relatively inexpensive standard, thin black metal. The number of images needed is difficult to be certain of and obviously depends on how many worthy photographs I make. However, as an approximate goal I am contemplating 20-30. This is a difficult question but, knowing myself, a very important one. As I mentioned above, the goal needs to be attainable but the project also needs to be completed in a reasonable period of time. In addition, I anticipate working on some other prints during this time and I suspect there may be some periods when I have very little time to spare because of work constraints. I have come up with a deadline goal of four finished prints every month. I plan to aim for one print a week, but I know that there will be times when I am unable to work on the project and times when I will be able to devote more time than usual.....so it seems to me that a monthly goal will be more reasonable. If I keep to that deadline, I should have the project well in hand by 6 months. I should add that I have many, many flower pictures that I have taken and not 'developed'. So the primary focus of project completion will be on the computer as opposed to actually taking the photographs. That said, it does take a good bit of time and experimentation to find a texture that works well with an image. Clearly, the starting point is an excellent botanical photograph, but that alone is not enough for what I am trying to do. I decided to put this goal in writing in order to help me keep to it, and I will post images and my progress as I go along. Because the next month is going to be quite busy for me at work I am going to give myself a bit of leeway at the start and declare today as the formal start of the project even though I already have 1 1/2 images processed. By September 27th I therefore need to have completed four images.